When you only need a few labels for a small job instead of an entire sheet, show off your efficient side with Avery® Mini-Sheets. 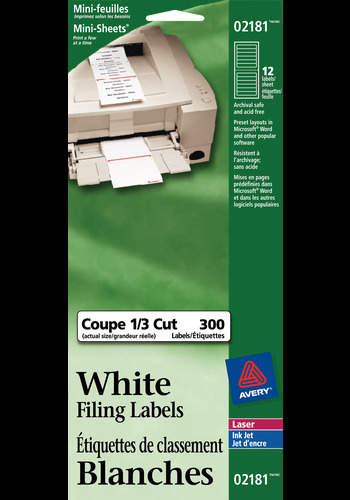 Delivering sharp print quality, these bright white labels make it even easier to find just the folder you're looking for. Design and print your own personalized labels using the free Avery® software and templates. Manually feed the Mini-sheets easily through your laser or inkjet printer and peel off only the labels you need or fold and separate along the perforation for future use. With these labels, you print precisely what you need - helping you achieve a lot when you only need a little.